These tandems have been built to a standard specification. 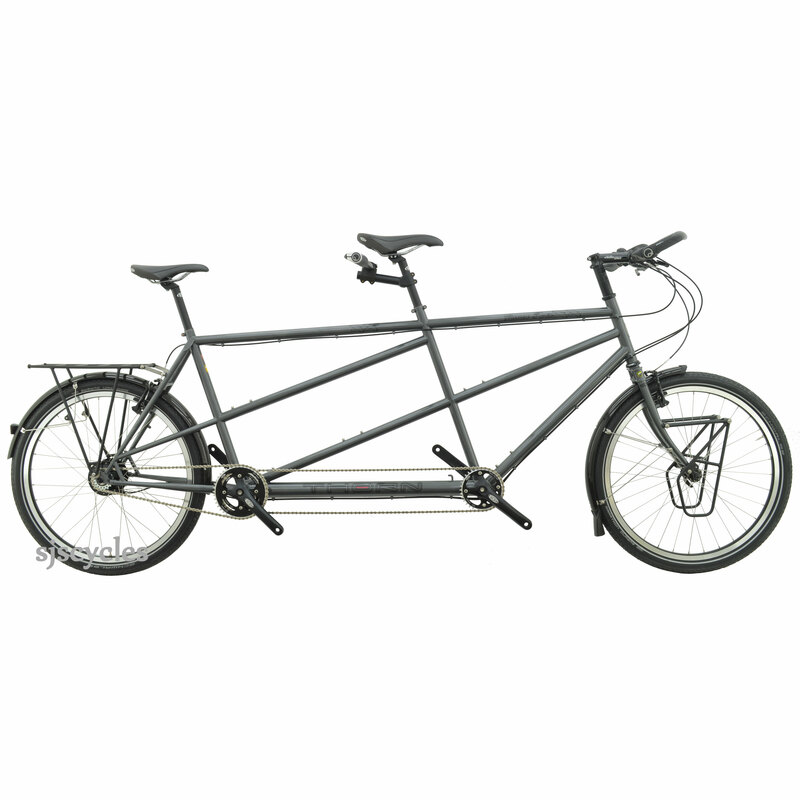 They are the last tandems from our current range, a new tandem is being launched mid-2017. The specification of them is fixed, any changes to the specification would be charged at full retail and the parts removed supplied with the tandem. These are an absolute bargain, keep in mind the start price of these tandems is usually £3149.00 without the carriers and other upgrades this tandem comes with. Frame : 11 L/L+ Thorn Raven Adventure Tandem Frame in Thorn 969 Steel - finished in Steel Grey powder coat with black decals. Fork : Thorn Twin Plate Tandem Fork in 531 Reynolds Steel. Wheelset : Rigida Andra 30 26" , 559 MTB Rims - Black - 32 Hole, Rohloff Speedhub 500/14 CC 14 Spd Gear Hub 32h Black inc. 17T Sprocket & Tandem Axle Plate, Shimano Deore HB-T610-L Front Hub - Black - 32 Hole, Schwalbe Marathon Dureme HS410 Folding Tyres - 26 x 2.0 Inch , 50-559. Transmission : Rohloff Speedhub 500/14 CC 14 Spd Gear Hub 32h Black inc. 17T Sprocket & Tandem Axle Plate, Thorn 104/64 PCD Triple Cranksets MK2 - Black - 170mm rear 180mm front, Shimano UN55 Sealed Bottom Brackets, Thorn 104mm BCD 4 Arm Reversible Single Chainring 3/32 Inch - Black - 43 teeth, Thorn 104mm BCD 4 Arm Reversible Single Connecting Chainring 3/32 Inch - Black - 34 teeth, KMC X1 Rohloff compatible 1/2 inch x 3/32 inch chains. Finishing Kit : SKS / Thorn Chromoplastic Mudguards - 26 Inch - P55 - Black, Velo Deluxe Sports Men’s Saddle - Black front, Velo Deluxe Sports Women’s Saddle - Black rear, Thorn MKIII Flat Track Bars - 10 Deg - 25.4mm Clamp - 580mm - Black, Kalloy AS-009 UNO 1 1/8 Inch Ahead Stem +17 Deg - 25.4mm Clamp - Black - 120mm, Adjustable Stoker Stem with Shim Alloy Black. Accessories : Thorn MkV Cro Mo Steel Lo-Loader - Black Powder Coat, Thorn Ping Bell - 22.2mm - Black, Thorn Expedition Steel Rear Cycle Pannier Rack. These tandems may have very slight marks or imperfections, no pedals included, NOTE - As these are sold at a discount our usual 14/100 day Thorn test ride guarantee does not apply. If ordered online for delivery the bike will be partially dismantled for shipping, you will require good mechanical competence to reassemble, or you will need to have a professional cycle mechanic re-assemble, typically this takes 2 hours. Please phone 01278441505 for a delivered quote 95% assembled.